Ring of Honor returns to Internet PPV Saturday night from Providence, R.I. with "Boiling Point" featuring Kevin Steen vs. Eddie Kingston for the ROH World Title. 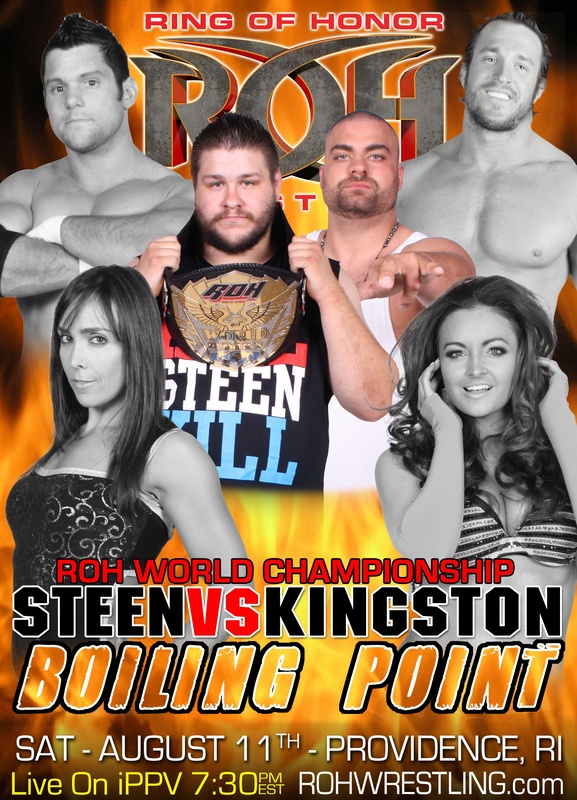 Steen-Kingston is the only title match scheduled for the iPPV. Also on the card are the Briscoes in a "tag team war," former WWE Diva Maria Kanellis in mixed tag action, Charlie Haas vs. Michael Elgin, Jay Lethal vs. Tommaso Ciampa, and TV champion Adam Cole facing Mike Bennett's trainer, "Brutal" Bob Evans. FYI: The iPPV is scheduled to begin at 7:30 p.m. EST Saturday night and will air on ROHWrestling.com for $14.95. Also, PWTorch columnist Sean Radican will have in-person coverage Saturday night on PWTorch.com. -- ROH World Title match: ROH champion Kevin Steen vs. Chikara champion Eddie Kingston. -- The Briscoes vs. Jimmy Jacobs & Steve Corino in a Tag Team War. -- Maria & "The Prodigy" Mike Bennett vs. Eddie Edwards & Sara Del Ray. -- Charlie Haas vs. "Unbreakable" Michael Elgin. -- Jay Lethal vs. Tommaso Ciampa in a 2/3 Falls grudge match. -- Roderick Strong vs. Mike Mondo. -- ROH TV champion Adam Cole vs. "Brutal" Bob Evans in a Proving Ground match. -- Matt Taven vs. Q.T. Marshall vs. Antonio Thomas vs. Vinny Marseglia in a four-way match.